Oregon Dairy Food Trailer will hold its Annual Lenten Fish Fry 11am – 6pm Every Friday & Saturday starting March 9 & 10 through March 30 & 31. 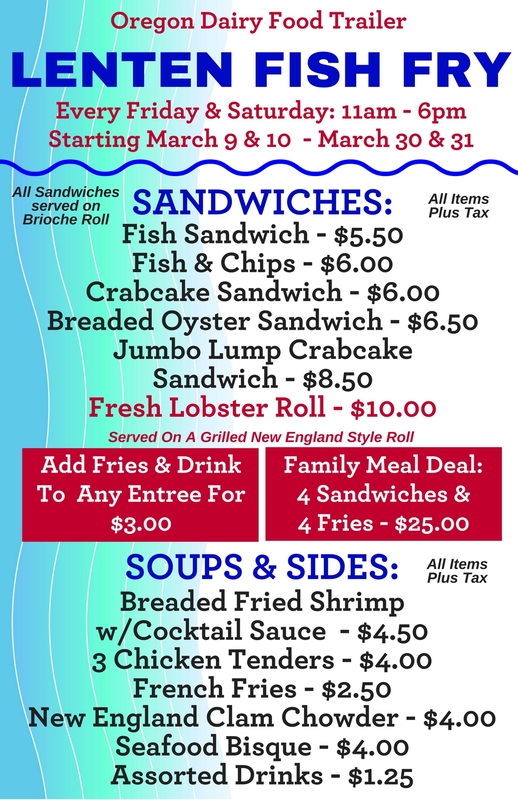 Featuring Fish Sandwiches, Fish & Chips, Crab Cake Sandwiches, Breaded Oyster Sandwiches, Jumbo Lump Crab Cake Sandwich and our Famous Fresh Lobster Roll served on a Grilled, Buttered New England Style Roll! Also Available, Breaded Shrimp with Cocktail Sauce, Breaded Chicken Tenders, French Fries, New England Clam Chowder, Seafood Bisque and try our Family Meal Deal – 4 Sandwiches and 4 Fries for Only $25!